(COLUMBUS, Ohio) – The Ohio State Fair’s best kept secret has been unveiled, and it’s bringing some holiday spirit to a summer tradition. 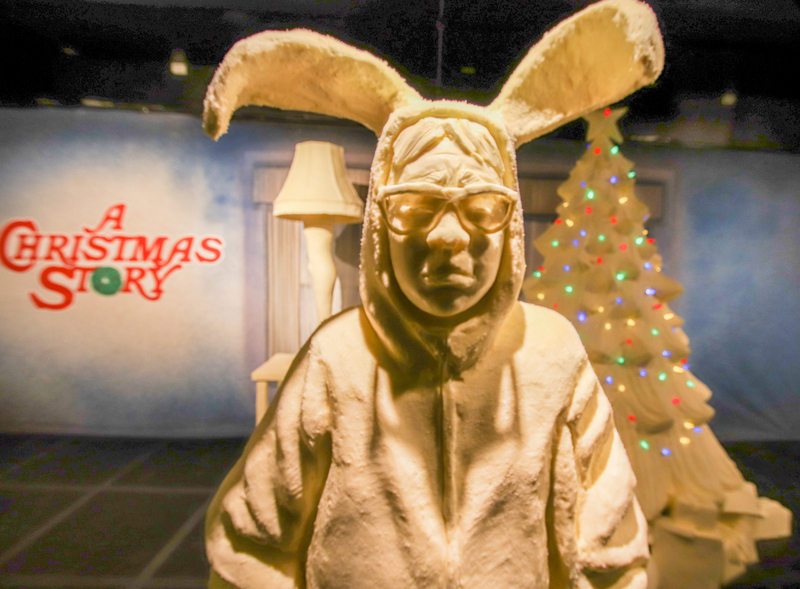 This year’s butter display, presented by the American Dairy Association Mideast, celebrates 35 years of the classic holiday film, “A Christmas Story,” which was filmed in Cleveland in 1983. 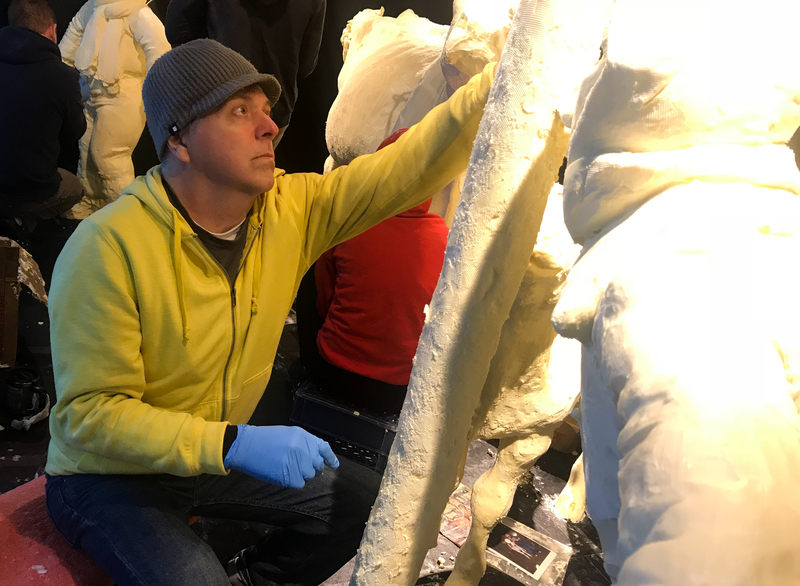 Inside the cooler, sculptors have recreated some of the movie’s iconic scenes in butter, including Ralphie in his bunny suit, a Christmas tree decorated with real twinkling lights, Randy in his snowsuit and, of course, the iconic leg lamp. And someone must have triple-dog-dared the butter calf because her tongue is stuck to a pole right alongside Flick as the traditional butter cow looks on. “Watching A Christmas Story is a holiday tradition for people across the country, and we’re proud that it’s one that started right here in Ohio,” says Jenny Hubble, senior vice president of communications for ADA Mideast. 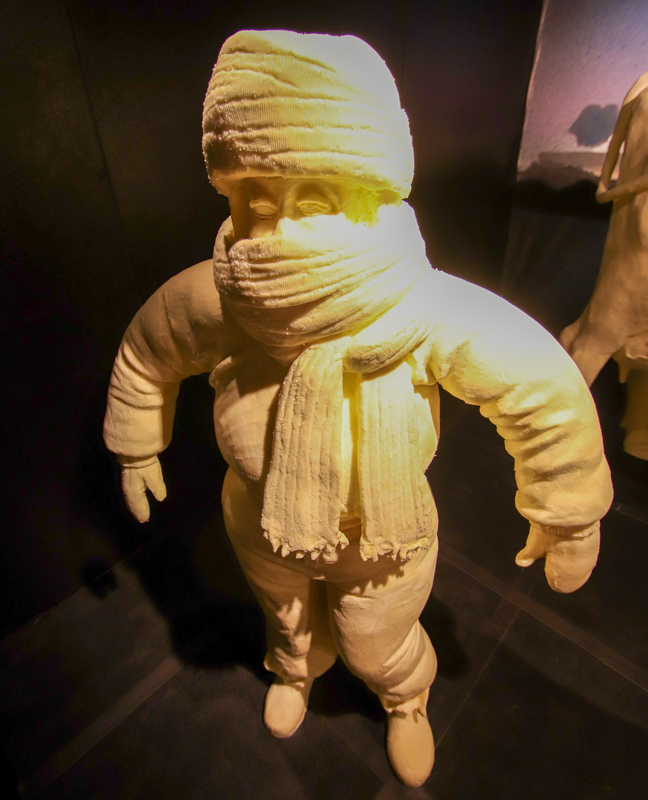 Sculptors spent about 400 hours in a 46 degree cooler to create the buttery works of art from more than a ton of butter. The butter sculptures are on display in the Dairy Products Building at the Ohio State Fair from 9 a.m. until 9 p.m. through August 5. Fairgoers can also learn about Ohio dairy farmers and enjoy treats like ice cream, milkshakes and cheese sandwiches. 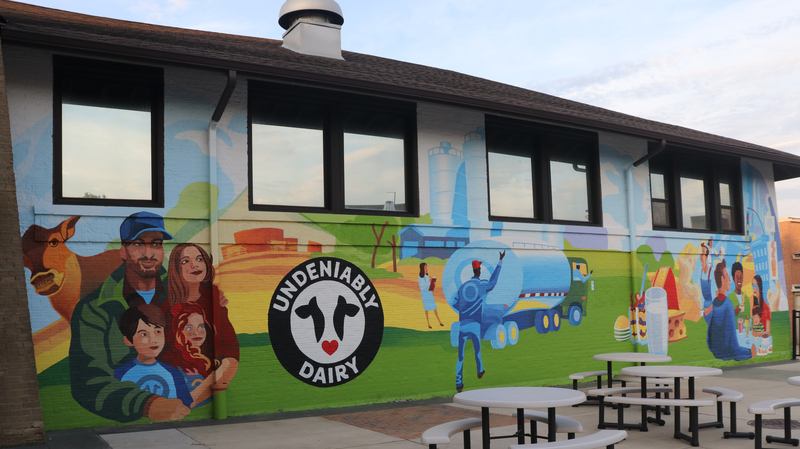 The Dairy Products Building, home of the butter cow display, features a new, hand-painted mural saluting those who are Undeniably Devoted to Dairy. 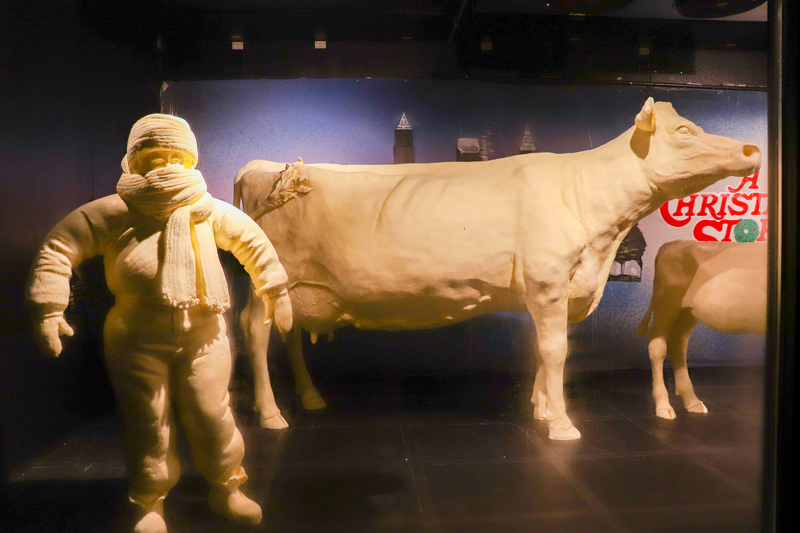 This year’s butter display features scenes from “A Christmas Story,” including Ralphie in his bunny pajamas, a Christmas tree decorated with real lights, Randy in his snowsuit, the iconic leg lamp and the butter calf and Flick with their tongues stuck to a pole, while the traditional butter cow looks on. The butter calf was incorporated into this year’s butter display theme at the Ohio State Fair. Someone must have “triple dog dared” her and Flick to stick their tongues to a pole. Each year, the American Dairy Association Mideast chooses a butter display theme that honors Ohio’s history and culture. 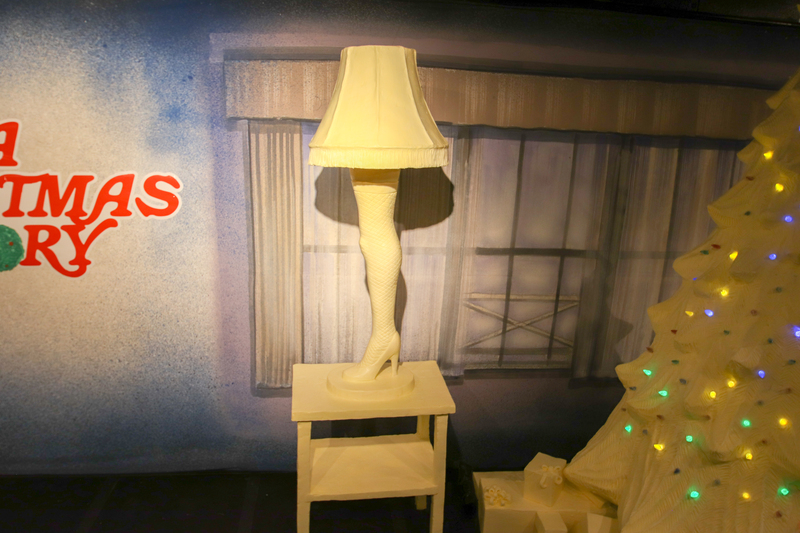 This year, they celebrate the 35th Anniversary of the classic holiday film, “A Christmas Story,” which was filmed in Cleveland. Fairgoers can enjoy the butter display through August 5, 2018 inside the Dairy Products Building, where they can also learn about Ohio’s dairy farms and enjoy treats like ice cream, milkshakes and cheese sandwiches. The butter display is a long-standing tradition of Ohio’s more than 2,200 dairy farmers. Each year, the display’s theme is one of the best-kept secrets leading up to the Ohio State Fair. 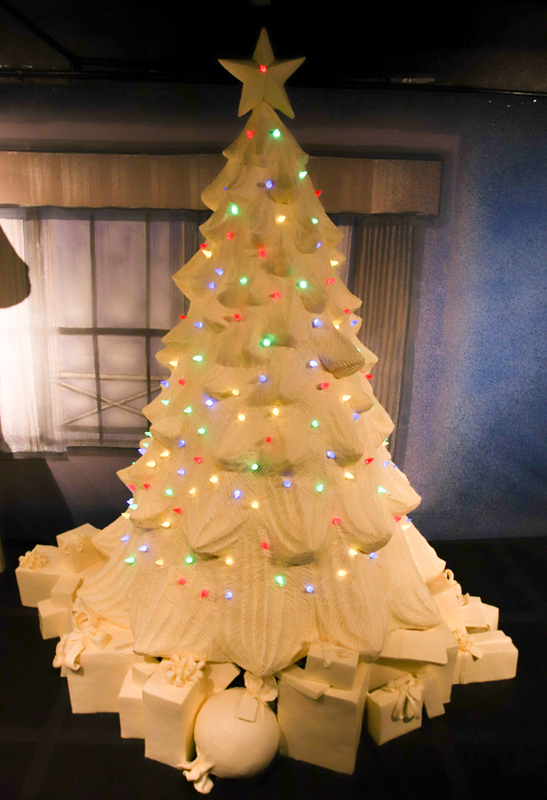 Sculptors incorporated twinkling lights into the Christmas tree butter sculpture. 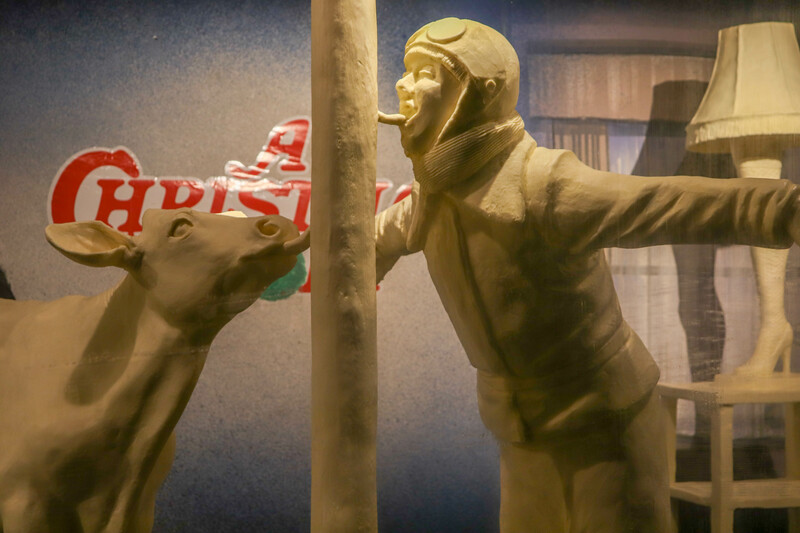 This year’s butter display pays tribute to a classic holiday movie filmed in Cleveland, Ohio, “A Christmas Story,” which was released 35 years ago. 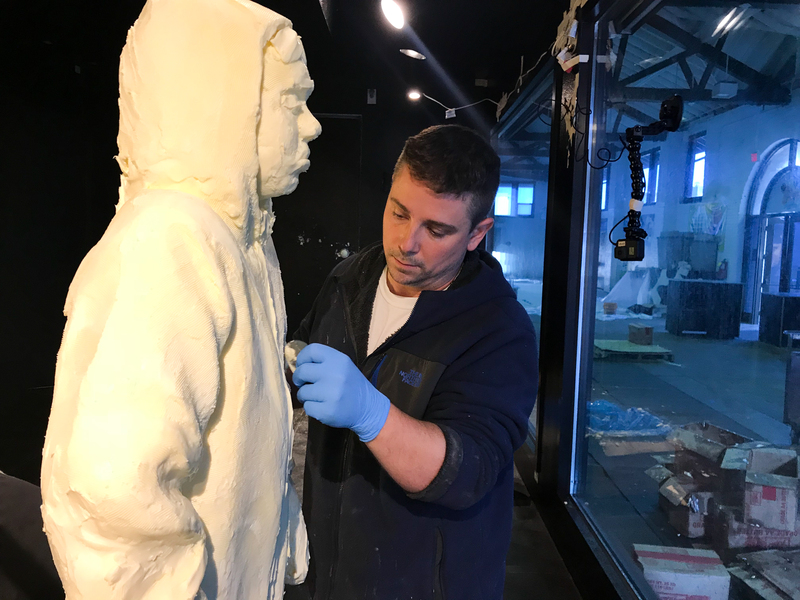 Alex Balz, one of the lead sculptors, molds a butter sculpture of Ralphie in his bunny suit. 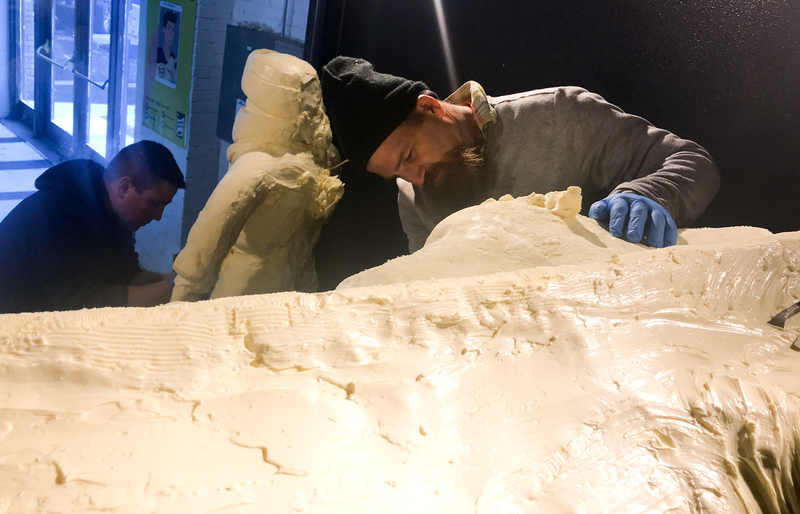 It took sculptors about 400 hours to complete this year’s butter display, working with about 2,200 pounds of butter in a 46-degree cooler. 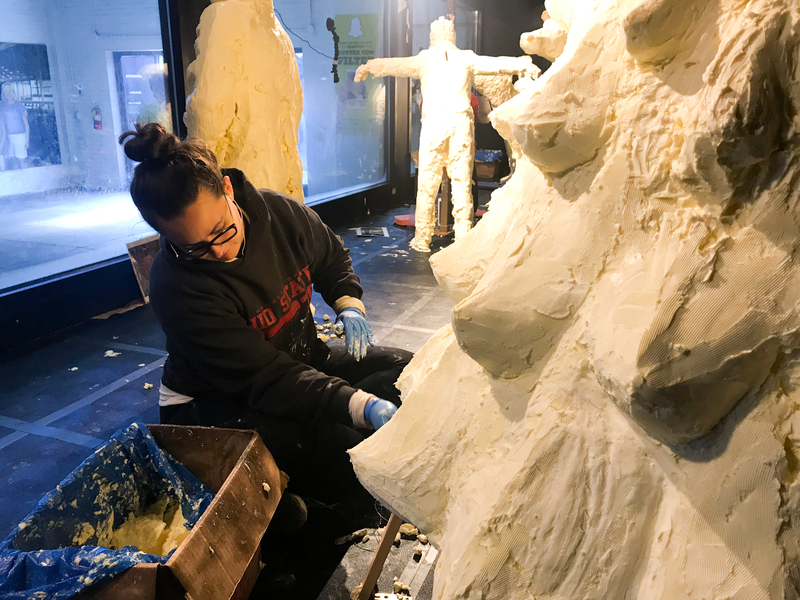 Erin Swearingen shapes the branches of the Christmas tree butter sculpture. 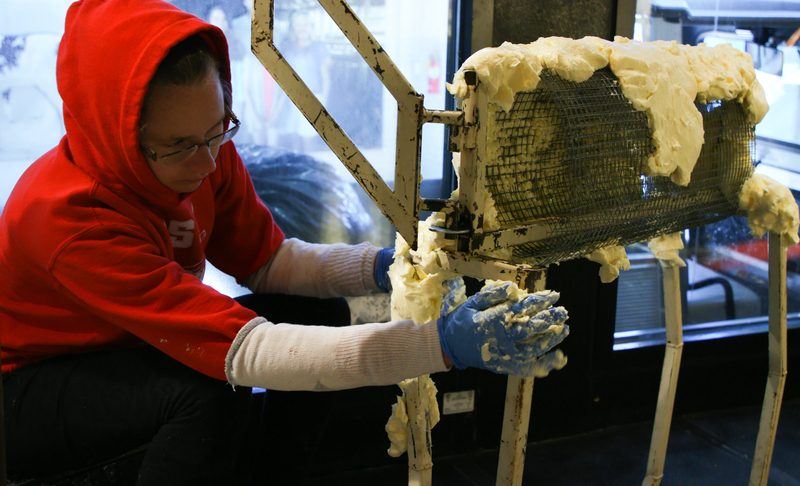 After several hours of shaping and smoothing the butter, sculptors chisel in the fine details last. 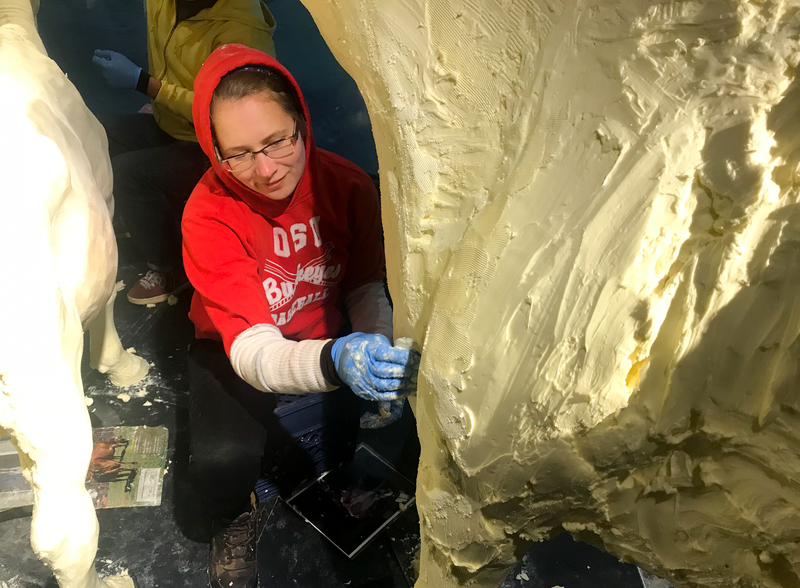 Tammy Buerk uses a small tool to shape the legs of the butter cow sculpture, an attraction that has been a mainstay at the Ohio State Fair since the early 1900s.